Iframes are an integral part of today's web development. They were earlier, they are now and they will remain in the future. ALthough you might have known that displaying your content inside Iframes may not be a sweet deal for search engines like Google or Bing when they crawl your website but Iframes are making all those Like buttons, and Twitter follower buttons possible on any website. However, while using Iframes on IE8 there is a small issue that you might encounter at times - the background transparency problem. 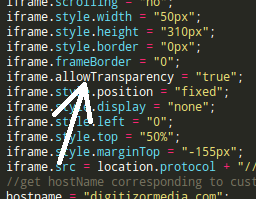 So when you load an iframe on your page you might notice that there is a white background inside the frame which you might want to get rid of at times.